A few days on the warm blue seas of the Turquoise Coast will provide memories lasting far longer than any suntan. Head to Fethiye and get on board. The Coastline between the Greek Islands along the Aegean and Mediterranean to Antalya and all parts east has become extremely popular for holiday makers from Europe and the Middle East. The climate guarantees day after day of sunshine, warm sea and the local cuisine of fresh fish, fruit and vegetables, fresh herbs and spices, olives and wonderful mezes; what more could you want. It is no longer important to fly huge distances to the Caribbean, the Pacific or the India Ocean to find paradise. If you travel less than an hour from the international airport of Dalaman you will find a town where you can board a yacht for a holiday that has everything you can possibly want. The town is Fethiye has grown dramatically in recent years to the extent that many tourists return year after year and others look to settle there after retirement. 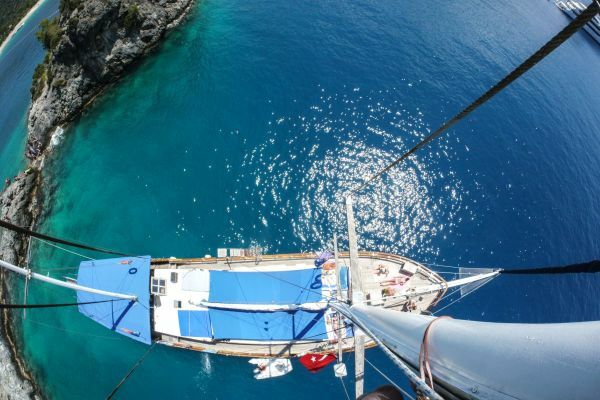 The immediate task is to unpack on a Fethiye Oludeniz yacht charter and get ready for the days to follow. There is plenty to enjoy in the town centre ranging from narrow streets with bars and restaurants, as well as to shops selling everything from carpets to herbs and souvenirs. The Fish Market is definitely worth visiting at some point during the holiday. You can buy your fish and take it to one of the surrounding restaurants and get it cooked. It is pleasure just to sit near the harbour and enjoy a coffee or a beer but it is even more fun to head out to see where you can do exactly what you want. Some people may actually fish for lunch or dinner with red mullet, sea bass or bream the most likely catch. The captain can cook the fish and prepare a salad for lunch or dinner before the sun sets. Even after dark the temperatures remains warm. Early the next morning after a comfortable night aboard, passengers can start the following morning diving into the beautiful sea before the yacht heads on to a new location. 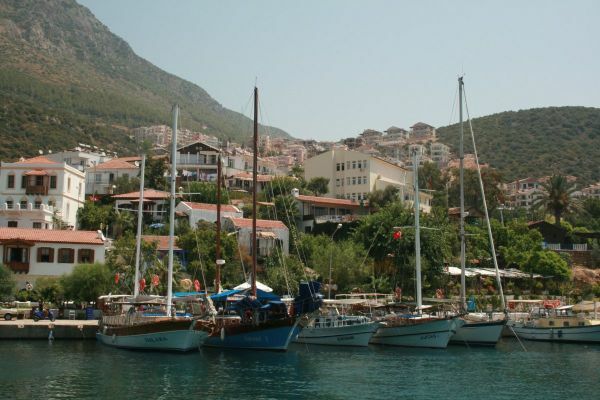 The name Oludeniz translated from Turkish describes the setting exactly. While the literal translation means ‘Dead Sea’ it is not as sinister as it sounds. The description is entirely because the waters are inevitably calm, ‘lifeless.’ It is a massive advantage for those trying sailing for the first time. 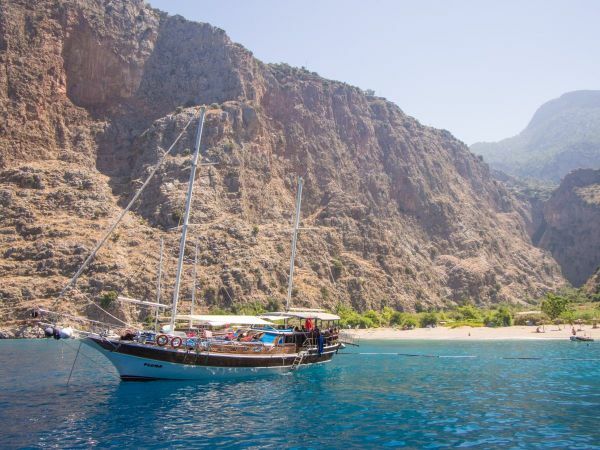 It’s the nickname ‘Blue Lagoon’ that reflects what tourists see on approaching Oludeniz. The image has been published many times in travel brochures, newspapers and on websites. The tiny resort whose numbers swell enormously in the summer months sits under the impressive Mount Babadağ just a few kms south of Fethiye. The beach in fact is pebbles but the seas are warm and crystal clear. Building is forbidden and so those taking a cruise from Fethiye will never be disappointed to come upon this place. Many simply want to relax on holiday. Those who seek the thrill of paragliding from the top of Mount Babadağ down to the beach is for those after a little bit more than a suntan. Others start out in Oludeniz on a route along the Coast called the Lycian Way; a walk that will takes several days as the whole distance is some 240 kms. It’s fun to simply dive off the boat to swim but scuba diving facilities are also available. Another place in the immediate vicinity that is best approached from the sea is Butterfly Valley. It is a steep sided canyon which is famous for its flora and fauna, especially the large number of species of butterflies and moths. Moths are often regarded as fairly plain but the highlight of any trip during the height of summer is the large Jersey Tiger which is extremely colourful. It is an entirely natural setting and though it is possible for visitors to stay overnight in the Valley, but they must respect their surroundings. The Valley is an escape from the tourist crowds, something that is guaranteed on Cruises in Turkey. Boats can drop anchor in complete solitude or take a berth anywhere along the coast. There are plenty of things that tourists can select to make up their itinerary; whatever they select they are certain for a memorable experience.